Steve and Pasha Carter have clearly won over the hearts of the Direct Sales Industry with their powerful main-stage trainings and servant leadership style. The duo might be a married couple, but they hold individual Direct Sales records. For instance, Pasha launched a six-figure business from her home in her late 20s, and she built a multi-million dollar business in her 30s. Out of 14 million women around the world she is ranked in the top 15 Female Networkers in the World. Steve is a Howard University graduate who has built a multi-million dollar networking business. As a recognized catalyst for developing trainings and strategies for building massive sales teams, Steve is consistently requested as a main stage trainer when arenas are packed with aspiring entrepreneurs. According to thousands of people around the world, he is one of the best Direct Sales Trainers, and one of the most powerful Success Coaches in the world. The Carters have been called one of “America’s Favorite Business Couples” in the Home-Based Business world. With almost 20 years of experience, they’ve led organizations of more than 100,000 members and helped thousands of people around the world become financially independent. Together, they have built a multi-million dollar empire and are the go-to experts for leaders who want to earn six and seven figures from their Direct Sales businesses. The Carters have been feature in The Wealth Choice: Success Secrets Of Black Millionaires by Dr. Dennis Kimbro, Networking Times Magazine, Success from Home, Business From Home Magazine, and many other publications and radio shows. Together, Steve and Pasha have traveled the world and empowered audiences of thousands. They have shared the stage with virtually every major speaker in the Personal Development and Leadership. “We know that every time we speak on a stage, it gives us an opportunity to empower someone in that audience” says the duo. Steve and Pasha take pride in the fact that they coach all types of people, from successful executives, who are six and seven figure earners, to the newbie entrepreneurs who are struggling to make ends meet. Their trainings primarily revolve around the subjects of leadership; success; and financial freedom. 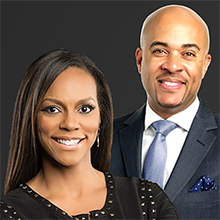 For people who want to become millionaires in Direct Sales, the Carters are the go-to experts.